Cordani, N., Pisa, V., Pozzi, L. and Sciorati, C. (2014). Isolation of FAP Cells from Mouse Dystrophic Skeletal Muscle Using Fluorescence Activated Cell Sorting. Bio-protocol 4(22): e1292. DOI: 10.21769/BioProtoc.1292. A population of muscle resident CD45-, CD31- cells expressing the mesenchymal PDGF receptor alpha (PDGFRα) as well as Sca-1 was first isolated in healthy mouse muscles in Uezumi et al. (2010). In the same year, Joe et al. (2010) identified and purified fibro-adipogenic precursors (FAPs), cells located into the interstitial space between myofibers close to vessels, negative for CD45, CD31,α7-Integrin, but expressing CD34, Sca-1. Both groups demonstrated that these cells are not myogenic in vitro or in vivo, but they are capable of differentiating in vitro towards both fibrogenic and adipogenic lineage (Uezumi et al., 2011). Further marker analysis indicates that the two groups identified independently the same cell population (Natarajan et al., 2010). FAPs are an important source of fibrosis and adipogenesis in dystrophic skeletal muscle (Natarajan et al., 2010; Cordani et al., 2014). We have recently demonstrated that Nitric Oxide regulates FAP fate inhibiting in vitro their differentiation into adipocytes. In mdx mice, an animal model of DMD, fed with a diet containing the nitric oxide donating drug, Molsidomine, the number of PDGFRα+ cells was reduced as well as the deposition of both skeletal muscle fat and connective tissues (Cordani et al., 2014). Here we described a method to isolate in both wild type and in mdx dystrophic muscle pure population of FAPs by double selection for SCA-1 and PDGFRα positivity in absence of the satellite cell markers SM/C2.6 and α7integrin as well of the pan-lymphocytes marker CD45 or endothelial marker CD31. Note: Animals were treated in accordance with European Community guidelines and with the approval of the Institutional Ethical Committee. Note: Use 1 ml of this solution for approximately 1 g of muscle. Sacrifice the mice (C57BL/6 or MDX) by delivering increasing concentrations of CO2 and remove hindlimb muscles. Leave them in cold PBS-containing dish. Remove visible tendon, adipose tissue and vessel. Mince the muscles on new dish (not containing PBS) using a curved tip scissor for few minutes until the tissue appears like a mush. Transfer the tissue into a 50 ml plastic tube and add 0.2% collagenase II in DMEM (serum-free). Volume to use is 2-4 ml of collagenase for 1 g of muscle weight: Usually each mouse allows obtaining 1-1.5 g of tissue. Put plastic tubes into a shaking thermostatic bath, at 37 °C for 1 h.
Separate undigested from digested material by centrifugation at 500 rpm. All the centrifugations are at room temperature. Supernatant (digested material) was removed, diluted with room temperature PBS (approximately 50 ml of PBS/1 g muscle) and go through a 18 G-10 ml syringe to create a single cell suspension (about 10 passages through the needle). Add to the un-digesting muscle fresh collagenase solution (using the same volume of step 6) and leave in the shaking thermostatic bath, at 37 °C for additional 30 min. Then, repeat step 7. Discard eventually indigested material that may remain after the second centrifugation procedure. Muscle slurries obtained by the two digestions were pulled and filtered through 70 μm cell strainer cap and subsequently through 40 μm cell strainer cap, using 50 ml syringes and 50 ml plastic tubes. Centrifuge at 2,000 rpm for 10 min and remove supernatant using a pipette. Eliminate blood red cells by re-suspending cell with 1-2 ml of erythrocyte lysis buffer. Dilute erythrocyte lysis buffer by addiction of 50 ml of PBS containing 2% FBS and centrifuge 2,000 rpm for 10 min at room temperature. After removing the supernatant, using a pipette, add 1 ml PBS containing 10% of FBS and count the cells. Centrifuge tubes 2,000 rpm for 10 min and incubate recovered cells for 30 min with anti-SM/C2.6-Biotin on ice. Use 1 µl of antibodies for 1 x 106 cells in 100 µl of PBS containing 2% of FBS. Add 1 ml wash buffer and centrifuge 2,000 rpm for 5 min. After removing the supernatant, incubate on ice for 30 min with Streptavidin-PE and with the other labeled antibodies [anti-CD31-PECy7 and anti-CD45-PECy7, anti-α7-Integrin-PE (for MDX mice), anti-PDGFRα-APC, anti-LY-6A/E SCA-1-APC/Cy7] and with 7-aminoactinomycin D. As in step 14, use 1 µl of antibodies for 1 x 106 cells in 100 µl of PBS containing 2% of FBS. Add 50 ml of wash buffer and centrifuge 2,000 rpm for 5 min. After removing the supernatant, add 2 ml of sorting buffer/mice. To set up the instrument, sample of about 50-100,000 cells were in parallel individually stained with the each single antibody or with 7-aminoactinomycin (single staining for compensation) in the same conditions of samples to sort. A sample of 50-100,000 cells was also no incubated with any antibody (unstained control). After 30 min, add 1 ml of wash buffer then centrifuge (2,000 rpm for 5 min). Remove supernatant and add 200-300 µl of PBS containing 2% of FBS. For cell sorter setting: Using unstained control, exclude debris and dead cells by forward scatter and side scatter and set basal fluorescence (Figure 1A). Then make 7-AAD gating using sample stained with 7-aminoactinomycin (gate 1, 7AAD negative cells and gate 2) to further eliminate dead ells. 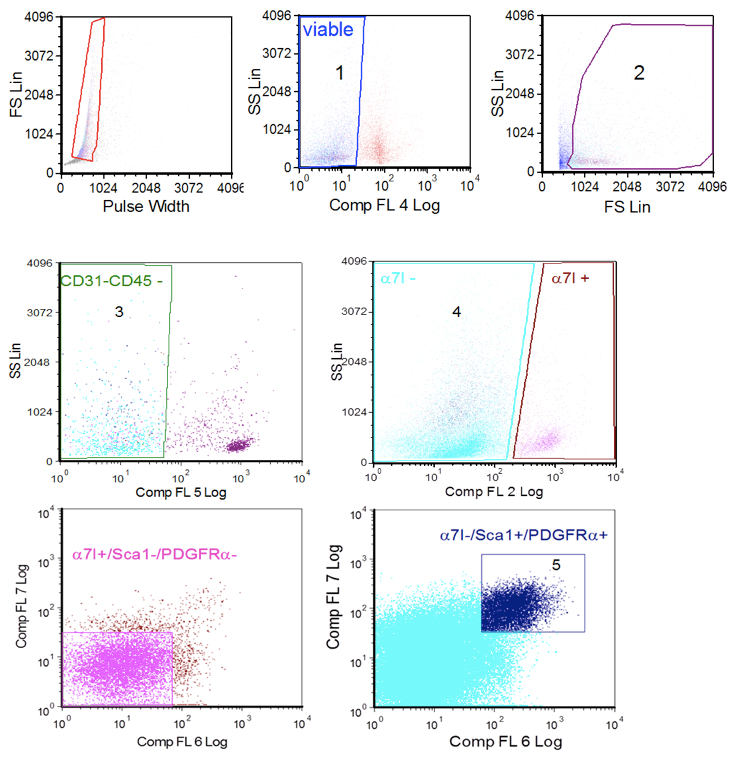 Compensate fluorescence using the samples individually stained with each antibodies and then select in sample to sort FAP cells as CD45-/CD31- (gate 3)/smc2.6- or α7integrin- (gate 4)/SCA-1+ and PDGFRα+ (gate 5) cells. To improve purity, we preferred to employ anti- smc2.6 for WT mice and anti-α7integrin for mdx mice. At the end of sorting, plate FAP cells at 1 x 104 cells/cm2 in multiwell plates previously coated with Matrigel and culture for 6 days in growth medium plus b-FGF in a humidified incubator (37 °C and 5% CO2). Figure 1. Cell sorter procedure. A. single cells gating; B. viable cells gating based on selection of 7ADD negative cells (1, left) and forward scatter/side scatter parametes (2, right); C. CD31 and CD45 negative cells gating (3); D. α7-integrin gating (4); E. satellite cells gating (Sca 1/PDGFRα negative cells from α7-integrin positive gate); F. FAP cells gatining (ScA 1/PDGFRα positive cells from the α7-intergrin negative gate (5). FAP cells recovery range from 1 to 3% of total cells. Digestion seems to be the critical point. 0.2% collagenase solution was prepared in DMEM, filtered on a 0.2 µm filter and immediately used. We are grateful to Prof. So-ichiro Fukada (Osaka University, Osaka, Japan) for the SMC/2.6 antibody. This work was supported by the European Community’s framework program FP7/2007-2013 under grant agreement n° 241440 (ENDOSTEM), the Italian Ministry of Health RC 2013, Associazione Italiana Ricerca sul Cancro (AIRC IG11362) and from the Ministero della Università e Ricerca PRIN 2010-2011. Cordani, N., Pisa, V., Pozzi, L., Sciorati, C. and Clementi, E. (2014). Nitric oxide controls fat deposition in dystrophic skeletal muscle by regulating fibro-adipogenic precursor differentiation. Stem Cells 32(4): 874-885. Fukada, S., Higuchi, S., Segawa, M., Koda, K., Yamamoto, Y., Tsujikawa, K., Kohama, Y., Uezumi, A., Imamura, M., Miyagoe-Suzuki, Y., Takeda, S. and Yamamoto, H. (2004). Purification and cell-surface marker characterization of quiescent satellite cells from murine skeletal muscle by a novel monoclonal antibody. Exp Cell Res 296(2): 245-255. Joe, A. W., Yi, L., Natarajan, A., Le Grand, F., So, L., Wang, J., Rudnicki, M. A. and Rossi, F. M. (2010). Muscle injury activates resident fibro/adipogenic progenitors that facilitate myogenesis. Nat Cell Biol 12(2): 153-163. Natarajan, A., Lemos, D. R. and Rossi, F. M. (2010). Fibro/adipogenic progenitors: a double-edged sword in skeletal muscle regeneration. Cell Cycle 9(11): 2045-2046. Uezumi, A., Fukada, S., Yamamoto, N., Takeda, S. and Tsuchida, K. (2010). Mesenchymal progenitors distinct from satellite cells contribute to ectopic fat cell formation in skeletal muscle. Nat Cell Biol 12(2): 143-152. Uezumi, A., Ito, T., Morikawa, D., Shimizu, N., Yoneda, T., Segawa, M., Yamaguchi, M., Ogawa, R., Matev, M. M., Miyagoe-Suzuki, Y., Takeda, S., Tsujikawa, K., Tsuchida, K., Yamamoto, H. and Fukada, S. (2011). Fibrosis and adipogenesis originate from a common mesenchymal progenitor in skeletal muscle. J Cell Sci 124(Pt 21): 3654-3664. How to cite: Cordani, N., Pisa, V., Pozzi, L. and Sciorati, C. (2014). Isolation of FAP Cells from Mouse Dystrophic Skeletal Muscle Using Fluorescence Activated Cell Sorting. Bio-protocol 4(22): e1292. DOI: 10.21769/BioProtoc.1292.